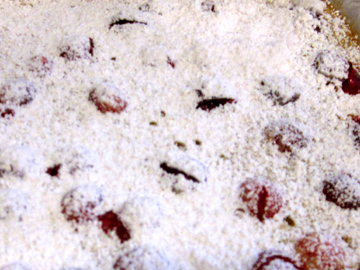 This entry was posted on Tuesday, November 30th, 2010 at 4:00 am	and is filed under Cookies and Bars, Cranberries, The Twelve Cookies of Christmas. You can follow any responses to this entry through the RSS 2.0 feed. You can leave a response, or trackback from your own site. Tinky, I hope you had a wonderful Thanksgiving! I love all the cranberry recipes you’ve posted. I am a true lover of the stuff. Unfortunately, I’m the only one in the family who is. But, I think the cranberry key-line bars might be just the ticket to change some minds around here. 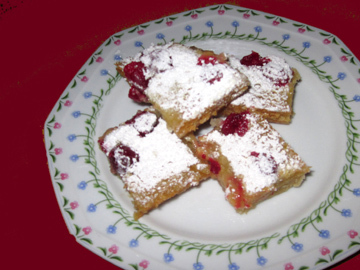 I usually buy several bags of cranberries around this time of year and throw them in the freezer, so I’m always on the lookout for great recipes. 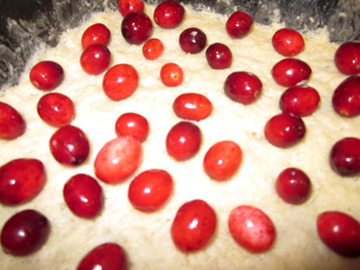 I usually just pour out what I will use for, let’s say, a cranberry-organe relish for myself. I want to convert others, though, since they are so full of good stuff. I’m going to print out some of the cookie recipes you’ve been posting over the year so I can start my Christmas cookie baking this weekend. Although I’m not a huge fan of what Christmas has become (too commercialized) I do love its true meaning, and the baking and cooking and family celebrations. these sound great! I think the combo of the two tart fruits would be delicious! Now these are my kind of cookies, Tinky! And I even have fresh key lime juice. I think I’ll put this one on the holiday list. In the meantime, I’m enjoying catching up on what you’ve been cooking while my laptop was in hospital. Hope you had a fantastic Thanksgiving! I think I will have to visit you …. I am in need of comfort food to help me cope with all the snow – and these definitely fit the bill!! Same to you, Grad, and I couldn’t agree more about celebrating the holidays in a simple and meaningful way. I would say, however, that the upside-down cake would be a better converter of non-cranberry folks than this, which is a tad tart. Abigail and EveryDay, thanks for the kudos (I wish I had that fresh juice; I settle for the bottled kind) and I hope your Thanksgivings were great. Frayed, I hope you and all of Europe get plowed out soon…..